Recently I tried the new book Being a Dog by Alexandra Horowitz after reading an interesting interview with her. I was struck by her idea of taking her dog on "smell walks," as I had also been allowing Petri to do a little more of that on our walks. I knew it was a good idea to let dogs have a bit of control over their walks and smell all the smells, but I didn't know much about it. But reading a whole book about a dog's sense of smell was honestly just too boring for me and I didn't make it very far. I'm sure it's a very good book, it's just not for me. 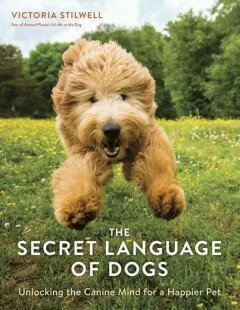 Around the same time it was released this fall, another book came out: The Secret Language of Dogs. Written by Victoria Stilwell, a famous trainer with a show on Animal Planet, this book is much more general and, as it turns out, way easier to read. It's only about 130 pages and that includes lots of large, colorful photos. This is the kind of dog book I can handle. The first, shorter, part of the book covers what's going on inside a dog's head. The way they sense the world, their emotions, their cognition. The second part, which is about two thirds of the book, is about reading and translating their body language. The short easy-to-read chapters cover everything from wanting to play to the confusion of old age, and the overall strength of the book is in its breadth, not its depth. This is great because it gives readers a basic overview and points them in the right direction without overwhelming them. For instance, the book mentions that if your dog is destructive while you're not home it's probably because of separation anxiety, so punishing the dog won't help and will likely be harmful. She doesn't say what you should do to help the problem, but readers would at least know that what they're dealing with is separation anxiety and they can seek out information about that. I was grateful the author didn't try to cover every problem in detail. As it was, I skimmed the parts in the early chapters that covered various neurotransmitters and whatnot. Here's a list of takeaways and interesting things I learned. I apologize for the length, but I want to be able to refer to these notes later. - The importance of games that make dogs think, smell, use their memories, and problem-solve. This prevents boredom (and compulsive behaviors) and may keep their mental acuity sharper as they age. - Dogs may be able to feel jealous (like if their humans hug each other and don't include them), but they can't feel guilt. The "guilty" look is appeasement because they know we're upset with them. - Dogs can have a paw preference, the way we are left- or right-handed. Right-pawed dogs are less easily aroused, better able to cope with new situations; left-pawed dogs show more stranger-directed aggression. In studies, those with no paw preference were more reactive to loud noises, and those with strong paw preferences more confident and playful and less anxious and impulsive. - Rolling on their back and exposing their belly means they want to be left alone, which is the opposite of how we tend to interpret it. They don't actually want a belly rub. - Licking, yawning, spinning, and shaking off are self-calming behaviors they may employ when stressed. I'm feeling a little concerned right now. - One example of the language of appeasement and deference is one they call "whale eye" and the illustration looks exactly like a photo I have of Petri, right down to the lowered ears and raised paw. So I guess she was saying that she felt uncomfortable and perhaps I should just leave her alone for a bit. - Dogs can have emotional problems, but not as complex as ours because they lack ability to imagine scenarios or employ elaborate storytelling. For instance, we may imagine that everyone around us is making fun of us behind our backs, but dogs don't. - When dogs get "the zoomies" (i.e. suddenly start running around crazily and out-of-control) it can be because they're excited or to release built-up tension from activities they don't like, and it's harmless. - Dogs especially sensitive to sound are more prone to anxious behaviors. - Humans are confusing and can be difficult to learn from because our behaviors are so inconsistent. All in all I found this book pretty informative and useful without being a slog or including way too much scientific information that isn't practical. I borrowed it from the library, but it seems like a great general guide to have on hand. What books have you read that helps you understand your dog more?